Marcus Smith is a receiver who played for the New Mexico Lobos. Converted from tailback to wide receiver he had a breakout year in 2007 finishing as one of the the Mountain West Conference’s top players posting over 1000 yards receiving. Smith had 67 plays of over 20 yards while playing for the Lobos, and displayed tenacity as a special teams gunner recording 26 tackles. His 3,746 all purpose yards rank 6th all time in Lobos history. Marcus displays explosive speed, is a nationally ranked track man, and a multi-faceted athlete. 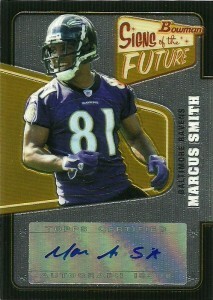 The Ravens drafted Smith in the 4th round of the 2008 draft but did not see any time in the lineup at receiver. Instead he again showed a knack for making the downfield special teams tackle as a gunner, with 6 tackles his rookie season. With an ACL sidelining him in 2009, he returned in 2010 to record another 21 tackles, but was released in the final cutdowns of 2011.